Just recently it was confirmed that the roster for Pokkén Tournament on Wii U was set to grow again ahead of its Spring release. 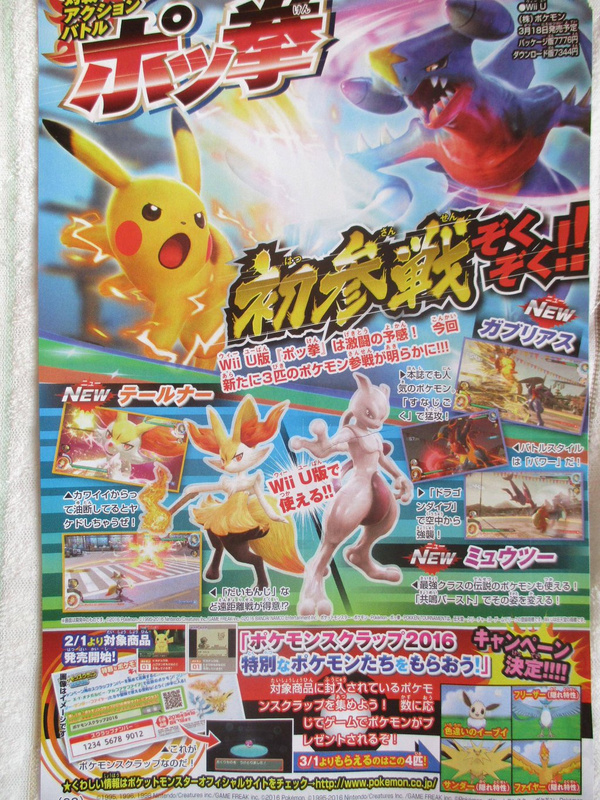 Now, courtesy of a CoroCoro leak - thanks Serebii - there are details of three Pokémon that will be playable and jumping into battle. It'll be fascinating to see how well this fighting game is received on Wii U in the coming months, and whether a sizeable audience will pick it up; Bandai Namco and Nintendo will hope to see the arcade port take off at retail. Are you happy with these additions and looking forward to Pokkén Tournament? Let us know. Wow, Braixen happens to be one of my all time favorite pokemon, the roster certainly just got much more appealing to me. Standard Mewtwo is nice to have as well. This just keeps getting better & better! PF is certainly getting more and more intriguing with every new update we hear about. I was a little sceptical at first, but it really seems to be getting fleshed out for the retail release. Pushing it as part of a Direct (or a special Pokemon Direct) would help to push people off the fence though I think; I'm not completely convinced yet! This was unexpected, but amazing. Looking forward to seeing braixen especially. I checked to make sure, and none of these three is the one being revealed later! Braixen? I wasn't expecting that at all. Nice to see Kalos get some representation. Garchomp and Mewtwo are cool Pokemon as well. 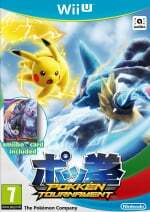 I hope we get to see more unexpected Pokemon like Suicune and Braixen in the roster. Definitely expected Delphox instead of Braixen. Either way having the regular Mewtwo along with Garchomp and Braixen just made this roster more awesome! Why Braixen and not Delphox??? Unexpected choice, but I'm super glad they picked it! Definitly one of my favourite Pokemon of Kalos, if not the most favourite. I'm kinda intrigued by this game. No interest in pokemon at all. This is a port of the arcade version in Japan right? Should I dip a littke toe? This is amazing! Garchomp is definitely one of my top favorite pokemon, and I personally like Braixen's design more the Delphox's so this is good. Finally we have a proper Kalos rep! Mewtwo was expected. It's be odd to have dark Mewtwo in here but no regular Mewtwo. Now all we really need is a good Unova rep. Dewott please! Well, a starter's medium evolution opens the doors for two cut veterans from Brawl, namely Squirtle and Ivysaur. Other than that, Delphox was definitely more expected but I won't complain at all. Also, regular Mewtwo was definitely an obvious choice: given the game's makers and source of inspiration, we can say you can't have Devil Jin without regular Jin as well. As for Garchomp, pseudo-legendary Pokémon like Dragonite, Tyranitar, Salamence, Metagross, Garchomp, Hydreigon, Haxorus and Goodra were also a given, but Garchomp was arguably less expected than Tyranitar, Haxorus or good ol' Dragonite. Again, not complaining! Great news all around! @AlexSora89 Well, "sadly", Dragonite is already confirmed as a support Pokémon in the game. Braixen is cool and unexpected, Mewtwo was always a given and Garchomp was also expected but good to see finally confirmed. Alright! I was waiting for regular Mewtwo to show up. Also, glad to see Garchomp and Braixen. Do. We. Really. Need. Two. Mewtwo!? That's worse than a clone! Sure, I can understand Braixen, but... why two Mewtwo? Why??? On the plus side, I'm not a fan o Garchomp personally, but it will easily be a welcome addition purely because of the variety it'll bring. Nice choices. Braixen is a strange choice, but I like it since Fennekin was my starter in Y, and it's good to see some 6th gen representation. Yes!! Braixen is one of my favourites, spent ages getting the shiny version in Friend Safari. By the way which Pokemon has the ra japanese character in it then? Braxien! Could this mean we'll get Frogadier too? I mean they have to let a water starter in at some point right? @Spin iirc none of them. That's another new character set to be revealed in two days. I hope that this game will inspire gamefreak to change the gameplay of the main games into something more like this. Think it would be cool if you catch wild pokemon and battle trainers like this mixed with rpg elements. I always imagined a pokemon game with Dbz tenkaichi like gameplay and this comes very close. I'm glad about the other two, but Mewtwo didn't come as a surprise to me. Of course if Dark Mewtwo is in, his non-dark counterpart would be in as well. That's like if PokéMon XD: Gale of Darkness had Dark Lugia, but no regular Lugia. Will there at least be some secret characters? Freaking Braixen? Now that was unexpected! I'm excited about Garchomp and Mewtwo though, so I can't complain. I wonder who the Pokemon announced on Twitter is going to be then. @ChromXsome Because that's expected and boring. Plus Braixen has the better design. Glad to see the roster is getting bigger! Don't know much about pokemons, but I'm kind of interested in this game, since it looks so fun! It seems many more characters will be revealed until this game gets released in may or so, not to mention the secret characters. I have faith in this one, I think is gonna be awesome. Regular Mewtwo is one of my favorite Pokemon. Along with Far fetched. We're all still waiting on the playable Walrein announcement. the only pokemon game i've ever played was the trainer for the card game. pokken tournament is so going to be the next one. i luv the idea that this might just join the smash games in the fgc. it's even better suited since it's an arcade game. So does this count for that "ra" clue we got last week? I'm not too privy on these Poke'mon's Japanese names. @SmaMan As far as I can tell from Bulbapedia, there isn't a "ra" symbol in any of those three's names. Interesting. @bro2dragons Wailmer PLEASE! Why? Because Mewtwo getting beaten by a ball shaped vaguely like a whale would be epic. YES! Garchomp is one my all-time favorite Pokemon so I'm very excited for this. Mewtwo is also good but expected, and I'm glad they picked Braixen as I prefer it to Delphox. My favorite fighting type is still missing from the roster. This will be a week 1 purchase for me. My kids will love playing this and with more and more additions being added it just gets better everytime. @Ogbert Frogadier is a support, it was confirmed around the arcade release as a pair with Eevee. Personally I hope we get Jigglypuff and Greninja since we now have most of the Smash Pokémon, might as well put the others in. I also want: a gen 5 Pokémon, it's my least favorite gen, but it'd be nice for every gen to get a rep, and for however many more Pokémon we need to do the same for every type. Hey, maybe I'll stop hating Shadow Mewtwo now. Main thought from day one on the thing has been, "What, the regular one's not good enough for you?" I find it hilarious that Braixen got in over Delphox because during their original X/Y reveal everybody was talking about how Braixen looked amazing and how they were going to pick Fennekin as their starter, but when Delphox was leaked everybody couldn't stop talking about how ugly they thought it was and switched over to another starter. @ASonic3582 ah dang I didn't see that. Love it's design. It would be nice for some of the less "cool" Pokémon to get a slot on the roster. And Swampert. @Spin None. That character is being revealed in 2 days. Braixen? Cool! I'm also hype for regular Mewtwo! I wonder how they decide who gets in? I do hope Mewtwo is different from his Shadow Version. Like maybe have one more close-range and mega-evolve into Mega-Mewtwo X and the other have more projectile moves and Mega-Mewtwo Y.
Garchomp? I always felt it was missing from the game. Seemed like a missed opportunity not to have it in here. But welp, here it is! Braixen! Screw Heracross, this is the one I've always been asking for. I might not have been as vocal but it but I always thought either Braixen or Delphox would fit into Pokken quite good as a projectile fighter. I imagine Braixen could have less of a close-ranged power but most moves do burning damage, slowly eating from the opponent's life bar for a few seconds. Can't wait to see those three in action! @SmaMan None of them do, no. Wait, wait... what? Doesn't the bottom of that page confirm Pokemon Amie and trading to and from Gen 6 in the Virtual Console Pokemon games?